WARNING: this will contain spoilers for book 1, Anna Dressed in Blood. Spoiler-free for Book 2, Girl of Nightmares. I absolutely adored Anna Dressed in Blood and couldn’t wait to continue the story with Girl of Nightmares. Because I just needed more. But, even though I liked it fine, this story unfortunately did not live up to the original. If I can re-use my Supernatural-comparison, I’d say Anna Dressed in Blood is like Supernatural seasons 1-5 and Girl of Nightmares is like Supernatural seasons 6-10. Still the same characters you fell in love with, still the same amazing world, still plenty to enjoy, but also somehow missing a bit of the magic that made you fall in love with it in the first place. For me, Anna Dressed in Blood was the highlight of this duology. It was amazing and awesome and I can’t express my love for it enough. But maybe my expectations for the sequel were too high. Maybe I shouldn’t have expected more of the same. So while I personally don’t think it’s absolutely necessary to read the second part in the duology, I’ll still give you a few arguments why you should and then you can make up your own mind. Cas. I don’t care that he spent most of the book moping around or thinking he was going crazy. He’s still the same sarcastically snarky, badass hunter I fell in love with. The friendship. The friendship between Cas, Thomas and Carmel was one of the best things in the first book. And it’s still very much present in book two. It’s not perfect, and they have some hiccups in their relationship, but it is realistic and glorious in its’ own way. More Gideon. Gideon was the only person in Anna who felt a bit underdeveloped. We never really got to know him, but it was always clear there was so much more to be told about him. And Girl of Nightmares definitely delivers on the Gideon-front. The ending. The last 25% of this book was glorious and made up for the slightly disappointing first 75%. I thought it was a perfect ending to the duology. So please don’t get me wrong. I still enjoyed Girl of Nightmares. It had a lot of things going for it that made it a good book. But unfortunately it was also missing some things that took Anna Dressed in Blood from good to absolutely amazing. The story moved a bit too slowly, there were not enough creepy scenes, not enough nail-biting suspense and most of all, not enough Anna. In conclusion: I definitely recommend Anna Dressed in Blood. I’d recommend Girl of Nightmares if you loved Anna Dressed in Blood and you’re not ready to let go of the characters and/or if you’re not yet satisfied with the ending of Anna. But if you’re only looking for more of the same, then maybe Girl of Nightmares is not for you. 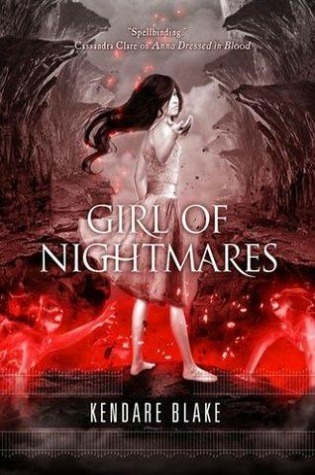 Have you read Girl of nightmares? What did you think about it?